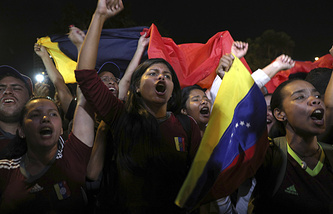 The Turkish president believes that "the people of Venezuela will support the leader they elected"
ANKARA, January 24. /TASS/. Turkish President Recep Tayyip Erdogan said on Thursday he was shocked by the decision of US President Donald Trump to recognize Venezuelan opposition leader Juan Guaido as interim president. "I was shocked by Trump's attitude [to the situation in Venezuela]. It is necessary to respect the person who won the election. We are coming out against any anti-democratic actions," Erdogan told a news conference in Ankara after talks with Maltese President Marie-Louise Coleiro Preca. The Turkish leader expressed confidence that "the people of Venezuela will support the leader they elected". He also reiterated that "the European Union ignored the attempted coup in Turkey in July 2016". He once again accused the European Union of failing to comply with pledges regarding migration issues. "The European Union is not honoring its pledges to Turkey on the issue. As of today, the EU has allocated only one fourth of the promised amount of six billion euros that is necessary for the settlement of the migration problem," Erdogan said.